#GivingTuesday + Hanukkah = it’s a Miracle! Want to instantly brighten the season for someone in need? You’re in luck—today is #GivingTuesday, and it’s your chance to fight Jewish poverty in Greater Boston. Every gift matters. You can help families stay safe and warm during the long winter stretch. You can help seniors keep their lights on. And you can help feed children so they don’t go to bed hungry. Happy Chanukah! Hannukkah! Hannukah! Channukah! Hanukah! Hanukkah! On December 9, enjoy a FREE community-wide celebration at the MFA. Tour the galleries, get artsy and try your hand at sketching, watch a film, and so much more. Plus, you’ll get to experience the Oculus Rift virtual-reality art installation! Get all the deets and register on Facebook. From December 6-13, explore the incredible installations across the city. Here’s a handy guide to get you going. Bonus! Share the season with friends and family old-school-style with JewishBoston.com. They’re offering an array of real (like, paper real) Hanukkah cards that they’ll stamp and mail for you for free! Get ‘em before they’re gone. It is with great sadness that we must remember 18-year-old Sharon native Ezra Schwartz, whose young life was ended far too soon by a Palestinian terrorist. As a community, it is our duty to honor those lost to senseless violence, and do all we can to share their story and prevent more lives from being lost. Help us share Ezra’s story now. That’s right, israel360 and PresenTense are buddying up! In conjunction with 8 Nights 8 Windows, enjoy “Israel by Design: What Makes Israel's Innovation Engine Run?” on December 7. You’ll get hands-on during fun activities and hear from guest speaker Viva Sarah Press, who’ll discuss innovations and entrepreneurship in Israel with Alex Goldstein, Vice President, Northwind Strategies. Ah, the suspense! On December 17 (that’s just a little more than a fortnight! ), we’ll be announcing the 2016 Chai in the Hub Honorees. Keep an eye on your inbox for the big reveal. Join us in saying “bon voyage” to the winter Birthright trip! They’ll be heading out on December 27 for 10 life-changing days in Israel. And make sure you stay tuned—when they get back, we’ll be sharing all the adventures. Okay, the pun was bad, but the content is good. All young adult grant applications are now online. Apply now! Make your gift to CJP’s Annual Campaign by December 31—it’s your chance to change lives in Boston, in Israel and around the world. Make a positive impact today - and get your 2015 tax benefit! You’re gonna love this. Brought to you by the creative geniuses behind our annual #TBT event, we’re excited to kick off a new series of awesome nights out on the town! The first will be January 14, and we’ll be sending you all the details in the very near future. This February, Eser’s spring series explores Ten Social Issues You Can't Ignore, covering an array of uber-relative social happenings ripe for discussion. Check out the topics, and sign up now—plus, if you sign up by December 31, you’ll get the early bird special rate! 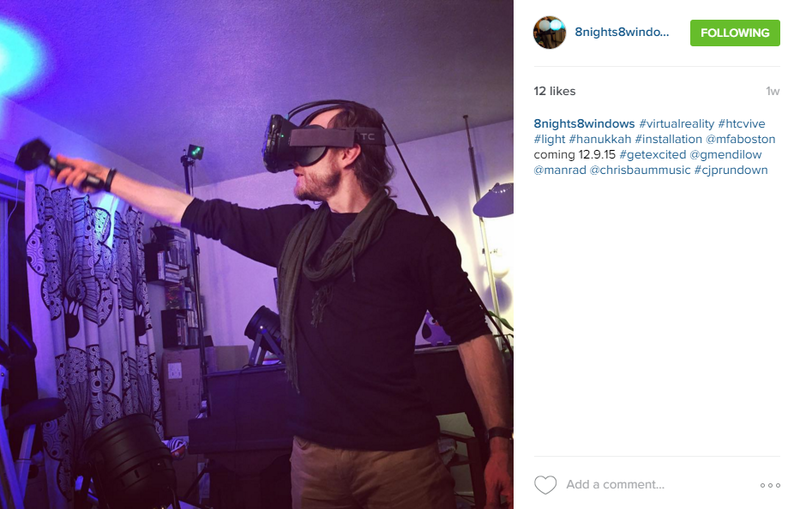 @8Nights8Windows gives us a (virtual) reality check. Are we excited to check this out at the Museum of Fine Arts, Boston, on December 9? Are latkes absolutely delicious? There’s your answer. December 4 | 3:54 p.m.
December 11 | 3:54 p.m.
December 18 | 3:55 p.m.
December 25 | 3:59 p.m.